It was this time last year we were making home-made apple cider with a big hand crank apple press. I thought I’d re-share the video for those curious about the process. This entry was posted in Activities, Kids and tagged activities, apple cider, apple juice, apple press, apples, homesteading, thanksgiving on October 8, 2012 by ChrisNolan.ca. 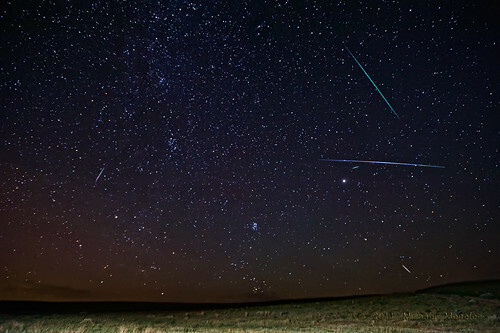 This year the Perseid’s Meteor Shower will peak at 1200h Aug 12, so late tonight will probably be your best chance to catch 90 to 100 meteors an hour. It’ll be tough for a single individual to see all of them though, so why not get a group of four together and lay down head to head so each of you gets a quadrant of the sky (if you’re into making an official count of them). And remember, don’t be discouraged if tonight isn’t a great night (weather or location wise) as it’s just the peak, there is still a pretty good chance of catching a few in the next week as well. For us city dwellers, Light Pollution will serious hamper your chances of seeing many so if you can, get out of the city to up your chances of catching a shooting star. If you’re keen to get info from experts, NASA will be holding a ‘Live Chat’ on their page starting at 11pm EDT. This entry was posted in Happenings and tagged activities, astronomy, backyard, events, meteors, perseids, stargazing on August 11, 2012 by ChrisNolan.ca.